Homeowners, gardeners, professional landscapers and commercial growers have discovered Liquid Fence® Deer & Rabbit Repellent Granular2 stops deer and rabbit damage. 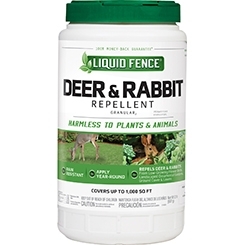 Unlike other deer and rabbit repellents that require the animals to browse to be effective, Liquid Fence Deer & Rabbit Repellent Granular2 works on scent, so deer and rabbits don’t even have to take a bite to be repelled. Because the animals’ natural aversion to this scent will never diminish, Liquid Fence Deer & Rabbit Repellent Granular2 DOES NOT have to be rotated with other repellent brands.